Hello Seattle! And Thomas Keller’s Leek Bread Pudding. | I made that! Hello Seattle! And Thomas Keller’s Leek Bread Pudding. I love it. All of it. I know it won’t last long, but the sun has been shining (in that low to the ground winter up north sort of way, but still) since we arrived and there’s talk of snow (!) next week. We’re finally emerging from a mountain of boxes, IKEA furniture, keeping the kitty from having a nervous breakdown and all the random details of moving and I am just beaming. Our new house is adorable, we ate dinner at Delancey last night, and I start my new job there tomorrow. But for now, another post about Thanksgiving. Yes…I’m aware that that happened a week ago, but I have been a little busy. And without a kitchen and/or pots and pans. So, anyways, Thanksgiving. I have no love for turkey roasting. I’ll eat it once it’s there, and I enjoy the gravy making part, but I’m just not that into turkey. This year I hosted a dinner and my close friends Jennifer and Tom volunteered to roast the turkey. This made me extremely happy, because it allowed me to focus on the parts I DO love, like veggies and pie. To switch it up a bit, I decided to forgo a stuffing and replace it with a savory bread pudding. It was a risky move, since there were some stuffing lovers in the mix, but it worked out very well. I poked around in my cookbooks and found a recipe for leek bread pudding in Thomas Keller’s new book “ad hoc at home” (which is now officially my favorite of his). It looked absolutely perfect. And I just love leeks. First I sauteed the leeks in butter for a while, until they were nice and squishy. 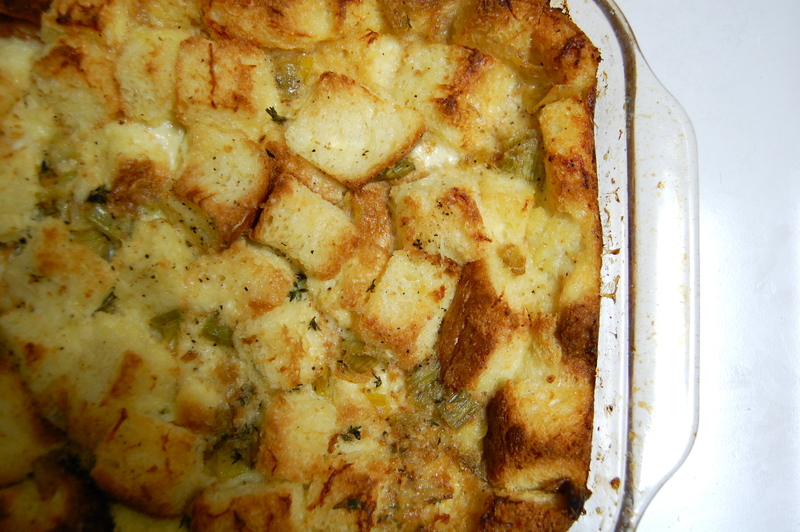 Then I layered a baking pan with the cheese, toasted brioche cubes, fresh thyme and the cooked leeks. I poured a custard into the pan, and pressed all the bread in, making sure everything was wet. I let it soak for about an hour. Then I baked it until it was bubbly and set in the middle. And it was fabulous. There was so much cream in the custard that it was super rich, which is not so perfect for every day, but just right for a Thanksgiving tummy blowout. Next time though, I’m kinda thinking bacon. – Put the leek rounds in a large bowl of tepid water and swish so that any dirt falls to the bottom of the bowl. 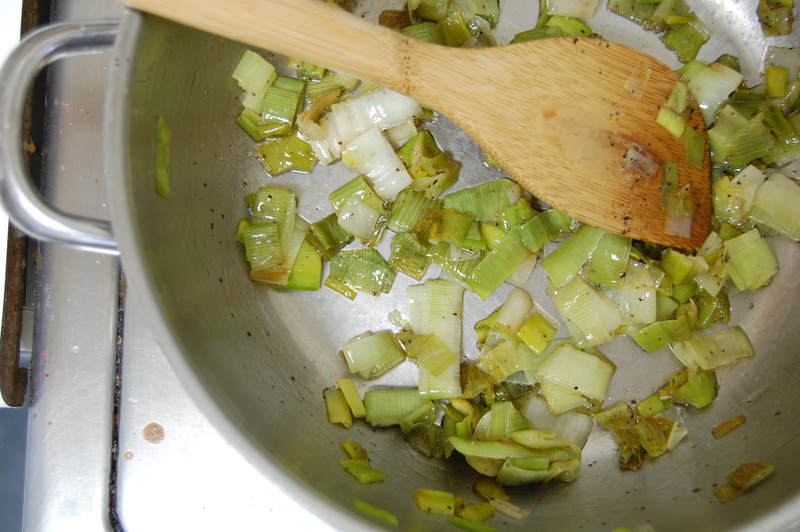 Set a medium sauté pan over medium-high heat, lift the leeks from the water, drain, and add them to the pan. Season with salt and cook, stirring often, for about 5 minutes. 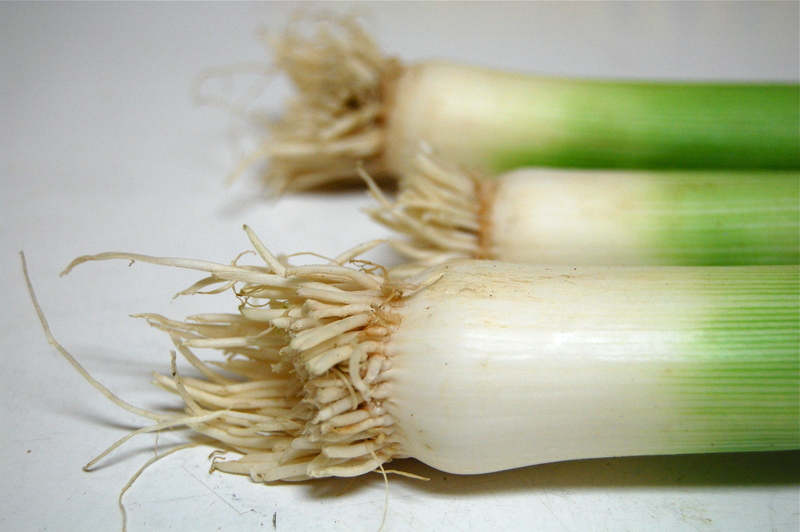 As the leeks begin to soften, lower the heat to medium-low. The leeks will release liquid. Stir in the butter to emulsify, and season with pepper to taste. Cover the pan with a parchment lid, and cook, stirring every 10 minutes, until the leeks are very soft, 30 to 35 minutes. If at any point the butter breaks or looks oily, stir in about a tablespoon of water to re-emulsify the sauce. Remove and discard the parchment lid. – Meanwhile, spread the bread cubes on a baking sheet and toast in the oven for about 20 minutes, rotating the pan about halfway through, until dry and pale gold. Transfer to a large bowl. Leave the oven on. – Add the leeks to the bread and toss well, then add the chives and thyme. – Lightly whisk the eggs in another large bowl. Whisk in the milk, cream, a generous pinch of salt, pepper to taste, and a pinch of nutmeg. – Sprinkle 1/4 cup of the cheese in the bottom of a 9-by-13-inch baking pan. 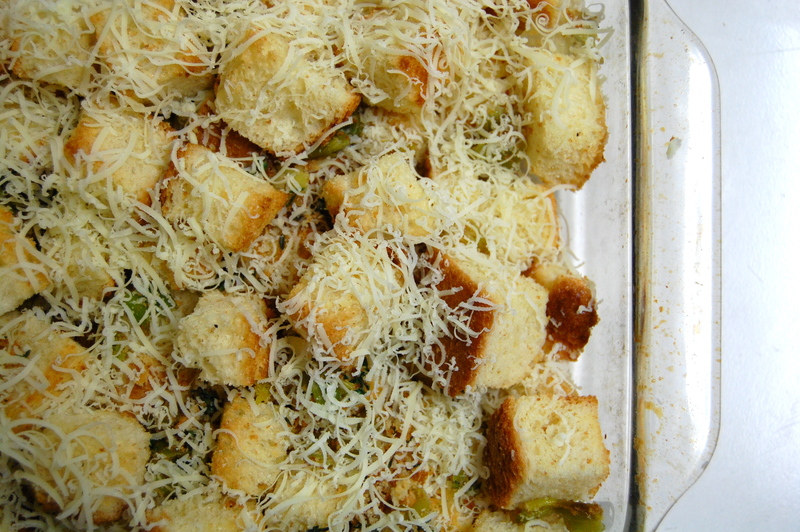 Spread half the leeks and croutons in the pan and sprinkle with another 1/4 cup cheese. 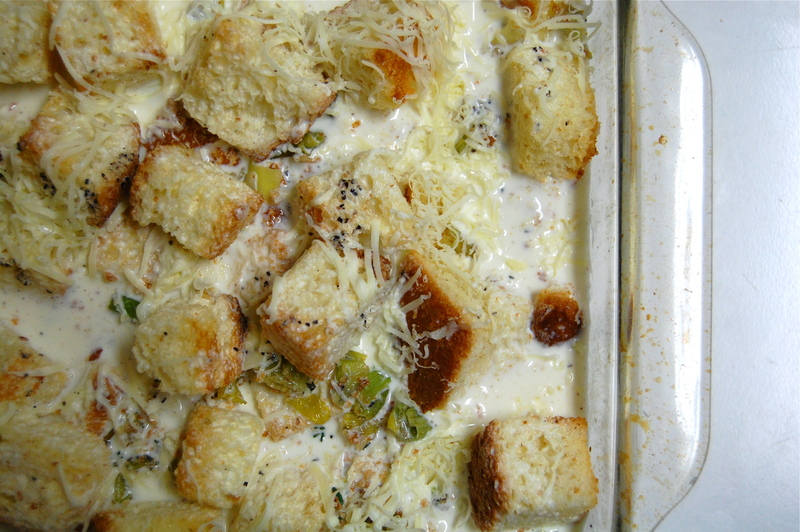 Scatter the remaining leeks and croutons over and top with another 1/4 cup cheese. Pour in enough of the custard mixture to cover the bread and press gently on the bread so it soaks in the milk. Let soak for about 15 minutes. – Add the remaining custard, allowing some of the soaked cubes of bread to protrude. Sprinkle the remaining 1/4 cup cheese on top and sprinkle with salt. – Bake for 1 1/2 hours, or until the pudding feels set and the top is brown and bubbling. new to your blog but…from the “looks” of things i think you will be a great delancey fit! thank you for letting us know that the pie crust & your “flake” technique will be in a later post!! i just bought that book for my husband, and i will be sure to get him to make this for me! i am moving to seattle at the end of the month. we were there last week to find a place to live, and luckily, we had time to have dinner at delancey. it was so fabulous! Welcome!!!! Leeks are my fav! I will definitely try this recipe and will peruse your blog often. Fantastic! Ohh! I just got the ad hoc book for Xmas and am officially in love with it before I’ve even made anything from it. Planning on digging in ASAP. Congrats on the move and hope everything’s going well in Seattle!